Danielle recently asked me some very specific questions about planning a whole year of homeschool in advance, the way I’ve gone about it for many years now. I’ve written before about mega-planning, and how I can’t stand to sit down every week and do it. I wanted to be freed from feeling tied to the lesson plan, and planning a whole year helps me to do just that. Can you please help me to understand a bit better how exactly you plan your year in advance? I've read your posts over and over gleaning all I can but I'm still left with a few questions now that I'm actually sitting down with my curriculum. How do you know how much time to budget for your subjects in terms of what can actually be accomplished? For instance, we're using Math U See for math. We're supposed to cover one chapter per week. So far Aiden has done about that pace. But what if he zooms through a lesson and doesn't need all the practice work? What if a topic is slow going and it takes us two weeks to get through it? How do I make room for that uncertainty in my master lesson plan? I’ll take that first question and try to break it down the best way I know how. Feel free to ask more in the comments and we’ll keep working it out. The easy answer for me may not be the best answer for you. Because I have been homeschooling for so long, I can gauge pretty well how long a lesson will take, or how far we can get in a text book per week. It does depend largely on the student; some drag through two workbook pages while others are like my Christian, who wants double the amount of Kindergarten work than I’ve been giving him. In his case, he’ll speed ahead into first and second grade, but I have full confidence that when he hits junior high, he’ll slow to a snail’s pace and end up doing his algebra in the summer. File that knowledge under, "Been there, done that". If your Aiden zooms through a lesson, woohoo! He’ll be done with Math earlier than June and you can either fill that time slot with something fun or give him free time. Lucky him! If he slows down, that’s great, too. It means he needs the time to go through it. I don’t write down which actual lessons to do each week for work that I consider to be independent, like math or handwriting. I expect a certain amount done each day (for us it’s two pages in their books), and if it isn’t done then they make it up in the evening (bummer for them) or over the summer. The over-the-summer make-up is my favorite because they moan like sick puppies and it’s a great life lesson they can learn early on. I’ll sympathetically say, “I’m sorry, bud. Remember this next year when you’re dragging your feet in March.” The next year when the foot dragging begins, I’ll remind them that we want to keep at it or they’ll be doing schoolwork over the summer. Each of my older kids will tell you that the summer they were stuck doing math or writing or whatever was the worst summer ever! 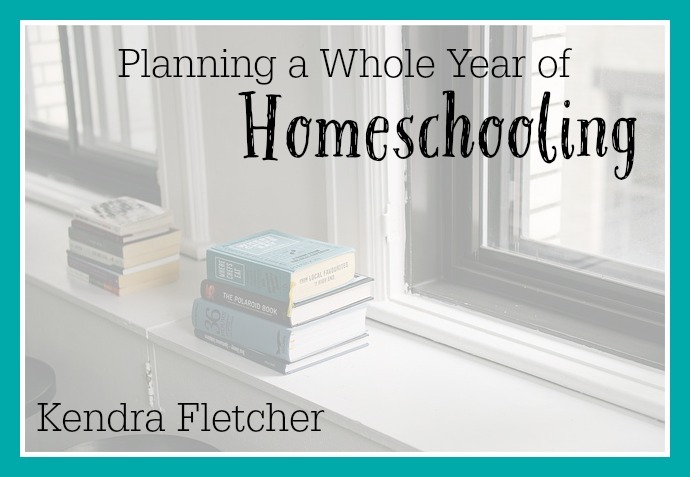 Join me for Planning a Whole Year of Homeschooling Part Two, where I'll address how to keep lesson plans in front of you.